If you have been visiting with us at Cornerstone, we would love to get to know you better! Plan to join us for lunch on Sunday, September 30th from 11:30 to 1:30 pm. Details will be at the Connect Table on Sunday. 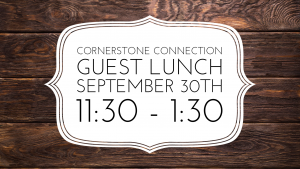 For more information and to RSVP, email Shawn at shawn@cornerstonecommunity.com.